If you’ve ever watched a frog eat prey, you’ve probably noticed that they close their eyes when swallowing. 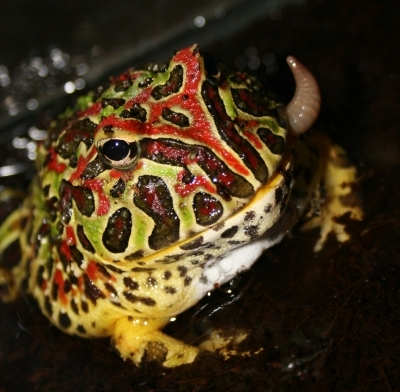 Scientists x-rayed frogs as they consumed crickets to discover what happens. 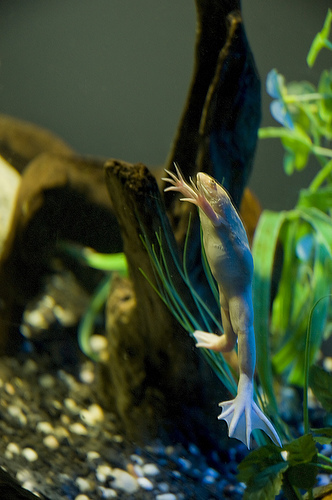 The x-rays showed that the frog’s eyes don’t only close as they swallow, they retract down towards the esophagus. During swallowing the eyes appear to touch the food and help push it down. They also may hold the food steady to help the tongue transport the meal. 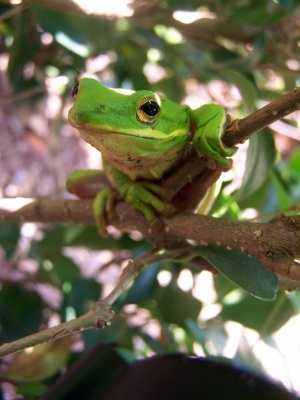 Frogs don’t chew their food which includes insects, snakes and birds. They force food down by a series of gulps using not only the eyes, but the tongue and feet as well. The job of the feet is to force prey into the mouth. Frogs eat their food whole and while still alive. Since the prey is live, closing the eyes will also protect them from any injury that may occur from a struggling creature. Besides closing both eyes at the same time, frogs have the ability to close one eye at a time. So a frog’s huge eyes not only provide it’s handsome appearance, but help him/her to swallow.